Obviously, there are a lot of festivals in Spain and I have already mentioned Halloween and Christmas in previous blog posts. 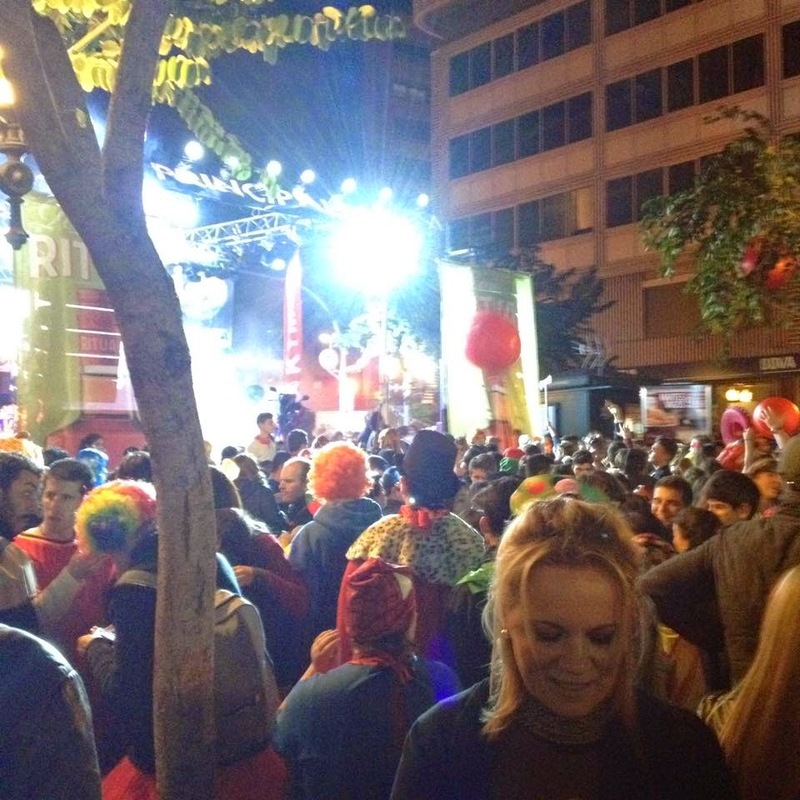 Spain loves a good party and if there’s the opportunity to drink in the streets then Spain does it – and they do it well! 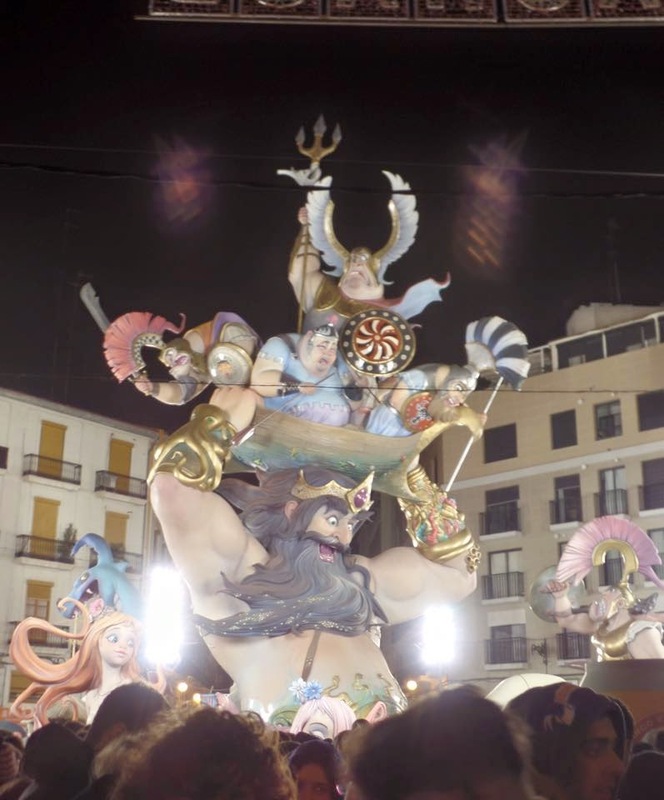 This term I have seen two of the biggest festivals in Spain; Carnaval (all of Spain and other countries too) and Las Fallas (Valencia). 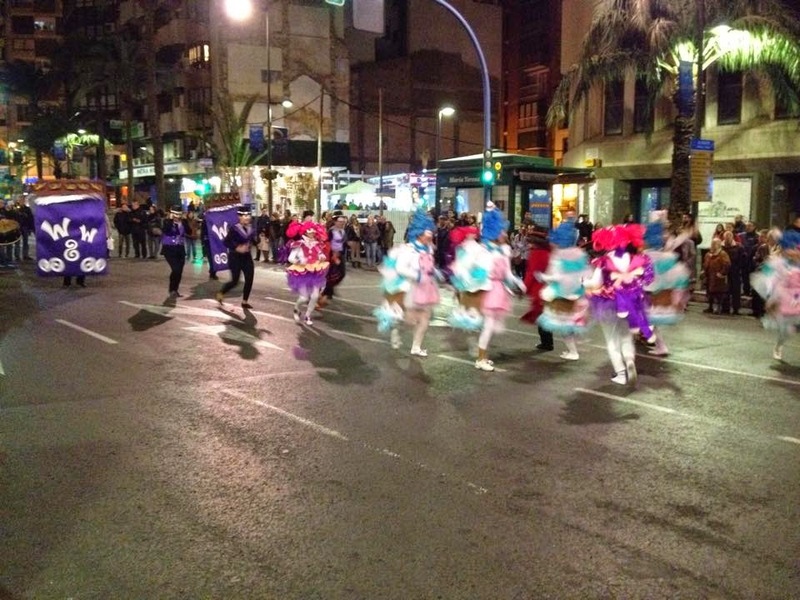 Carnival is Spain’s equivalent to Britain’s Pancake Day in that it marks 40 days until Easter. 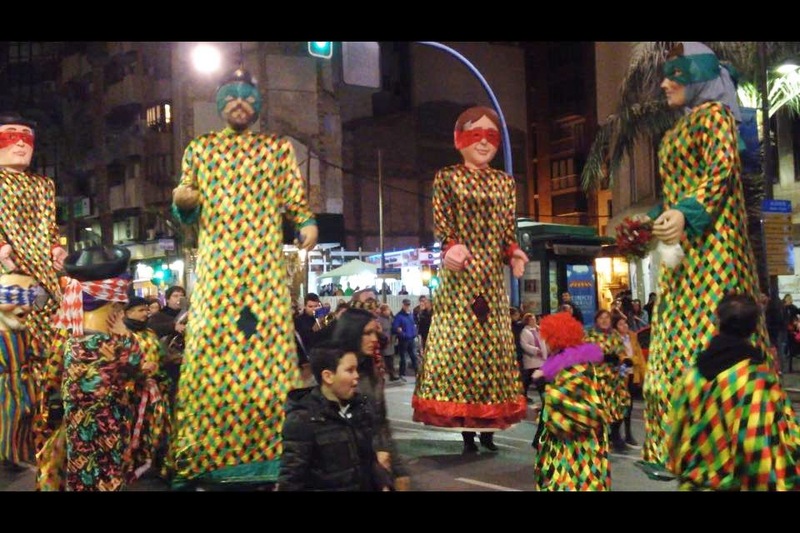 I had heard a lot about Carnaval before I saw it and I was expecting lots of people to be drinking in the street in fancy dress, some home-made, some bought – generally on a low scale. Carnaval was so much bigger than I anticipated!! It all started on Friday 13th of Feb when I was at home on my own eating dinner and working through my vocabulary book. About 10pm I started to hear music but couldn’t see anything from my flat. Eventually about 10.55 I decided to walk down the street to see what was going on. A whole parade was at the end of my street ready to walk down La Rambla (one of the main roads in Alicante) there were huge groups of people all in different fancy dress with music and dance routines and everything! At the front there were some big giant people things (not sure who or what they really were) and then the rest of the parade consisted of people aged 2 up to the elderly! Was so nice to watch all the positivity and coming together of a community. I was stood nearish the start and the last thing went past me at 11.40pm. Spain likes to do things quite late! 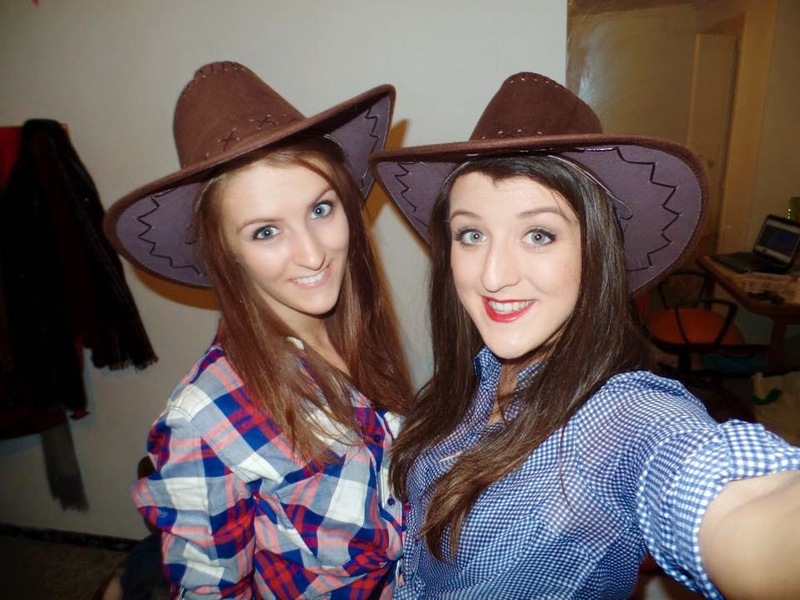 The next day was the actual Carnaval day so Beth came to visit from Benidorm so we could party together. Around half 7 we had another parade of children come down my street, all playing drums and dancing. This was actually at least the third parade just in my road – I can’t remember how many there were in total! We went out about midnight to Canalejas park to drink where apparently everyone goes to drink. Little did we realise how long it would take us to get there! We tried to walk down La Rambla but it was RAMMED with people!! I have never seen so many people in one street at once and I don’t think my blogging skills will really be able to express what it was really like! There were two stages set up in the street, one with a DJ set and one with live music, absolutely everyone was dressed up and they had all spent so much more time and/or money on these costumes than I expected – they were amazing!! Everyone was drinking and merry and the atmosphere was just one of the craziest things I’ve ever seen in my life!! I really hope I make some really good friends this year so I can visit them again next year for carnaval! 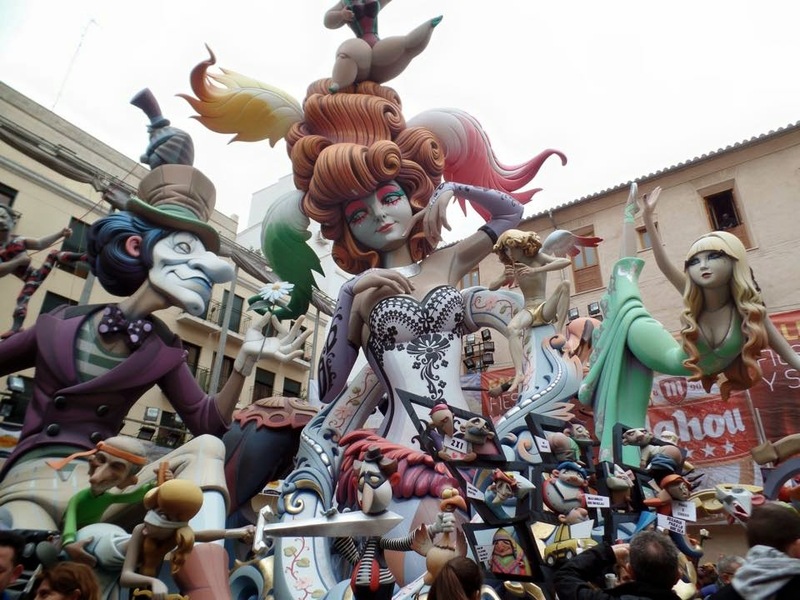 The week just gone has been the celebration of Las Fallas in Valencia. Unfortunately I still had to go to school Monday to Wednesday so I couldn’t see all of it but Beth and I made it for the last day on the 19thof March. Again, my creative writing skills will probably not be able to express the madness of this day! Our day started at 2pm when we went to the Plaza de Ayuntamiento (Town Square) for Mascletá. This is basically just a daytime fireworks show but with the entire population of Valencia trying to watch! We could only see one part of it so the bit we could see looked cool. The thing that took me aback most was the noise. I have never heard something so loud in my life! Imagine your head is in a drum and someone is playing the drum whilst at the same time you’re in the middle of a war zone with guns firing everywhere and then a train goes past at 200mph a metre away from your head. That’s what it sounded like. We then went for a walk around the city and by following the crowds managed to see some really impressive stuff! We saw quite a lot of Fallas around the city centre – some about 2 metres high and some about 7 storeys high! We’re still not 100% what the Fallas are made of, but we’re thinking mostly polystyrene and wood and a bit of metal if need be. 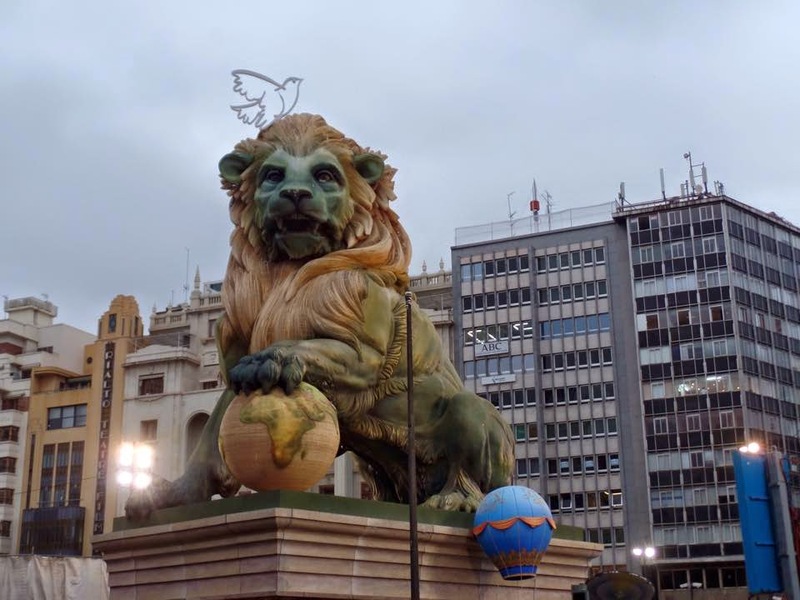 These Fallas are huge sculptures that represent something bad that has happened in Spain in the past year. Most seem like Tim Burton meets Disney but they all 114 of them meant something! All the signs were in Valencian so we couldn’t understand. 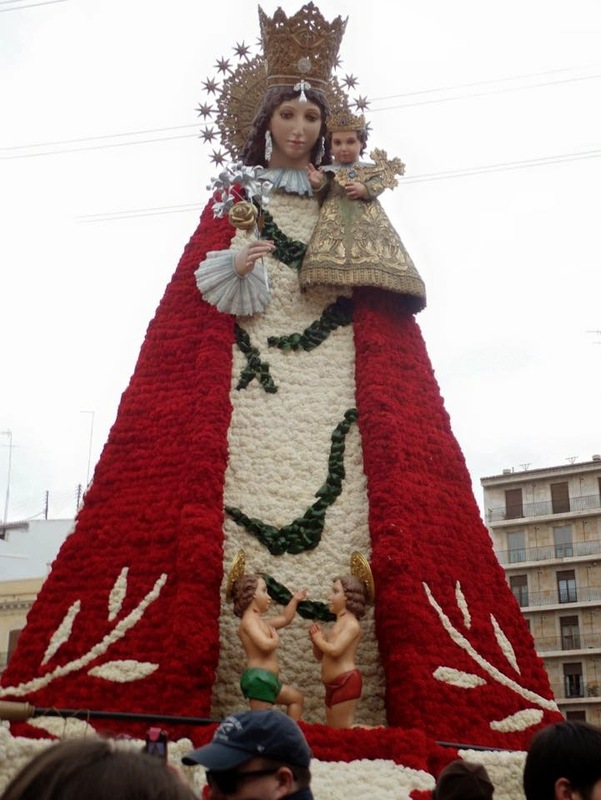 We also saw a huge Virgin Mary who’s dress was made completely out of flowers outside the cathedral. She was about 3 stories high and the whole square was filled with flowers like an offering to her. It was so pretty! I love flowers! We relaxed in our hostel for a bit and went out for dinner and that was when it really started. Remember bangers that we used to play with when we were kids? Those little bags of gunpowder that you throw on the floor and they go bang? They were being set off all day (but a bit louder and bigger than the English ones) and then at night they seemed to get bigger! These were basically just little bombs that people were lighting and then throwing on the floor and you wait a few seconds before it explodes and makes a huge bang that echoes through the streets and makes you jump every time! A few people even took it that one step further and put them in cans so that they made a flash and a bang so loud that if you were within 3/4 metres of it, you could feel the force of the explosion!! I have never felt so unsafe walking down the street! At 12pm we went to see the burning of one of the fallas. We waited for about half an hour beforehand so that we could get reasonably close and it was so worth it! When the time came, Catherine wheels went off around the falla then fireworks shot up into the air and then gradually the amazing 4 storey high sculpture was demolished in an inferno of huge flames!! It was so cool to see but also quite sad watching someone’s masterpiece be destroyed in the space of 20 minutes! Although there were firemen on hand spraying buildings with water so that they didn’t get ruined, there is not a chance in hell this would ever be allowed to happen in England! The heat and the smoke was so intense that me and Beth got very red faces and were pushed back 2 meters by the crowd in front of us that much have been dying in the heat! We then went to see the grand finale. In the Plaza de Ayuntamiento at 1am there was the burning of the main falla (a giant lion) and more fireworks which were just as loud as the first! We got a lot closer this time and had a perfect view of all the fireworks and we watched how the lions mane burst into flames and then the rest of the lion was cremated. I’m so glad I paid the ridiculous amount I did to see Las Fallas! I also got to try Buñelos which are like churros with little bits of pumpkin in them which are amazing, went to the city of arts and sciences again and we met up with Holly, who’s another Nottingham Trent student, spending the semester at the University of Valencia for drinks. The main Falla in the Plaza de Ayuntamiento. Imagine just the mane on fire! 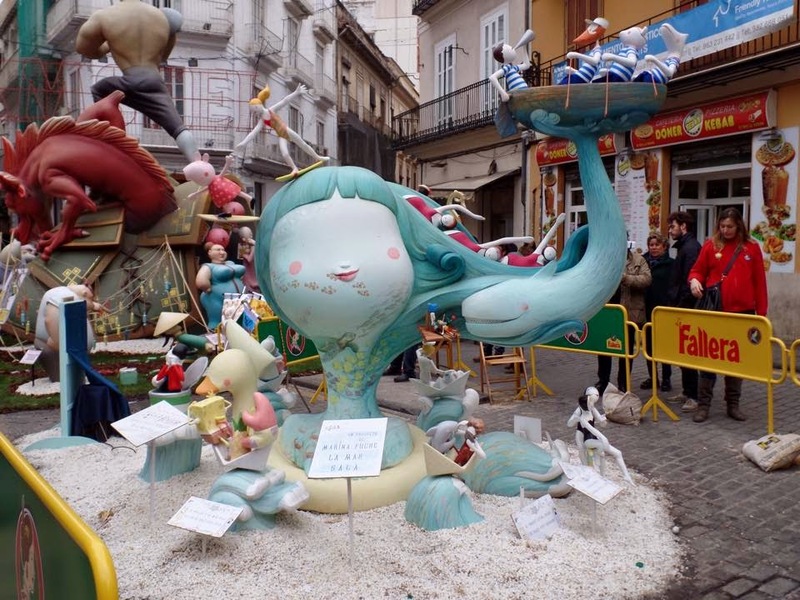 The winner of the children’s fallas (made by children – takes them a year). Spot Spongebob Squarepants! 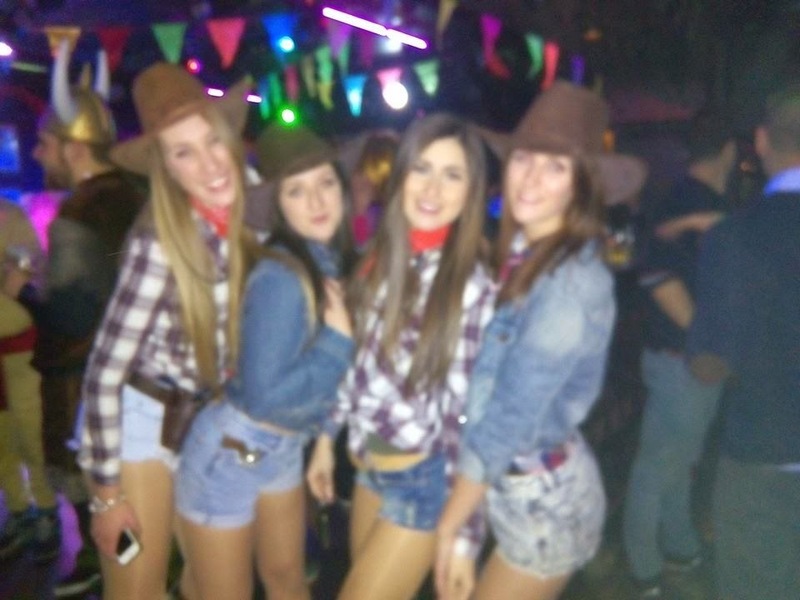 The winning falla. This is about 7 stories high and it’s so wide it hasn’t all fitted in the picture!! The Virgin Mary, all the white and red is flowers! The Falla that we watched burn. Neptune and Ariel and some Romans. After such a brilliant few days, I’m feeling pretty low now. All I’m doing is spending the day working through my to do list looking forward to going back to school and then next Sunday I’m going on tour with my uni in Lloret de Mar and then I fly straight home for a long Easter weekend with my family and friends from home! Cannot wait! !